Energy efficiency of split air conditioners is rising in recent years due to improvement in air-conditioning technology. In general, the efficiency of an air conditioning system is measured in seasonal energy efficiency ratio (SEER). Since 1990, SEER of residential and commercial air conditioners increased 50% and 57% respectively to reach 4.2 and 4.2 respectively in 2016. Split air conditioners are more energy efficient than window air conditioners. Typical SEERs of air conditioners including split air conditioners is highest in Europe, followed by Japan, South Korea, China, the U.S., Singapore, Canada, Australia, Thailand, India, Saudi Arabia, etc. Generally in developed regions such as Europe, energy efficient split air conditioners are in high demand due to stringent environmental regulations. However, even emerging economies such as Asia Pacific is seeing an increasing demand for energy efficient split air conditioners. VRF systems are seeing rising demand in the Middle East. With increase in population and economic activity, in 2011, the Dubai Supreme Council of Energy, launched the Dubai Integrated Energy Strategy 2030 which aims to reduce energy demand in the UAE by 30.0% by 2030. To cap energy demand, VRF (Variable Refrigerated Flow) air conditioners are seeing increasing demand in the UAE and in the overall Middle East. In 2014, according to global air conditioning systems manufacturer, Midea Group, VRF demand in the Middle East was 20,000 units. A gradual shift in consumer preference from chillers/ ducted air conditioners to the VRF system is taking place. In Saudi Arabia, growth in demand for VRF systems is above 5.0% which is higher than the growth of room air conditioners (RAC). Qatar in the Middle East is expected to host the FIFA World Cup in 2022. The FIFA World Cup is considered the greatest football show on Earth. The Middle East is expected to provide good opportunity to split air conditioning system manufacturers due to expected increase in VRF demand. The study provides a conclusive view of the global split air conditioning systems market by segmenting it in terms of equipment type, application, and distribution channel. In terms of equipment type, the market has been classified into mini-split, multi-split, VRF, and floor ceiling. Based on application, the market has been segmented into residential and commercial. Based on distribution channel, the market is segmented into online and offline. The offline channel is further segmented into conventional stores and company-owned stores. The conventional stores distributional channel is further divided into DIY stores, specialty stores, and supermarkets. The company-owned stores distribution channel is further divided into dealers and installers. Hot climate, rise in population, and increase in disposable income is expected to increase the demand for split air conditioners in India and other Southeast Asian countries. This has prompted global air conditioning system manufacturers to set up production units in India which is further reducing the cost of split air conditioners in India. This offers a good opportunity to global split air conditioning system market players to invest in the India split air conditioning system market. However, the cost of split air conditioning systems is an issue. Split air conditioners can be mini-split or multi-split. As per U.S. Department of Energy, the primary disadvantage of mini split air conditioners are their high cost. The price of mini-split air conditioners ranges from US$ 1,500 to US$ 2,000 per ton of cooling capacity. The upfront cost of energy efficient split air conditioners are more than conventional air conditioners. For example, in China, the price of energy efficient split air conditioners are generally 2X more than conventional air conditioners and generally entail a ten year payback period. Thus, price of split air conditioners along with rise in energy consumption of split air conditioners is restraining their market growth. The report highlights major companies operating in the global split air conditioning systems market which include Daikin Industries, Ltd., United Technologies Corp., Hitachi, Ltd., Panasonic Corporation, Electrolux AB, Mitsubishi Electric Corporation, Midea Group Co., Ltd., Samsung Electronics Co., Ltd., Sharp Corporation, and Lennox International Inc. This report on the global split air conditioning systems market provides analysis for the period 2016–2026, wherein 2017 is the base year and 2018 till 2026 is the forecast period. Data for 2016 has been included as historical information. The report covers market dynamics including drivers, restraints, opportunities, and trends that are expected to influence the expansion of the global split air conditioning systems market during the said period. The study provides a comprehensive analysis on market growth throughout the above forecast period in terms of value estimates (US$ Mn) and volume estimates (‘000 Units) across different geographies. The major construction markets in the world are China, the U.S, and India. Rise in residential construction in these countries is expected to increase demand for split air conditioners in the global market. In March 2014, China published the “National Urbanization Plan 2014 – 2020.” Through this plan, China plans to move 100 million people from rural to urban cities and increase the number to 250 million by 2026. Residential construction played a significant part in meeting China’s GDP targets in 2016. Since 2015, residential construction prices have increased by 25.0% in Beijing, Shanghai, and Shenzhen. The U.S. is seeing a rise in multi-family housing projects. In October 2018, according to the U.S. Commerce Department, the number of multi-family housing projects increased 10.3% to 363,000 units. Overall, the U.S is witnessing an increase in residential construction. In India, residential construction is a major part of the overall construction sector. Thus, rise in residential construction is increasing the demand for split air conditioners in China, the U.S. and India, which is driving the global market. The study provides a conclusive view of the global split air conditioning systems market by segmenting it in terms of equipment type, application, and distribution channel. In terms of equipment type, the global split air conditioning systems market has been classified intomini-split, multi-split, VRF, and floor ceiling. Based on application, the market has been segmented into residential and commercial. In terms of distribution channel, the market is segmented into online and offline. The offline channel is further segmented into conventional stores and company-owned stores. The conventional stores distribution channel is further divided into DIY stores, specialty stores, and supermarkets. The company-owned stores distribution channel is divided into dealers and installers. The analysis of the above segments is based on present and forecasted global demand for split air conditioning systems and the prevailing and future trends in the market. We have analyzed the present and estimated regional market size of split air conditioning systems across North America, Europe, Asia Pacific, Middle East & Africa, and South America. The regional split air conditioning systems markets are further broken down into country level markets in the following geographies: the U.S., Canada, Russia, Italy, Spain, France, U.K. China, Japan, India, GCC, South Africa, and Brazil. The global split air conditioning systems market consists of global players as well as large number of medium and small players. The report includes detailed analysis of the global split air conditioning systems market, SWOT (Strength, Weakness, Opportunity, and Threats) analysis of the market, Porter’s Five Force analysis, key macroeconomic indicators influencing the market, split air conditioning systems market regulations in various geographies, and trends. The industry analysis includes value chain analysis of the global split air conditioning systems market. Daikin Industries, Ltd., Mitsubishi Electric Corporation, Midea Group Co., Ltd., Samsung Electronics Co., Ltd., Electrolux AB, Panasonic Corporation, United Technologies Corp., Hitachi, Ltd., Sharp Corporation, and Lennox International Inc. 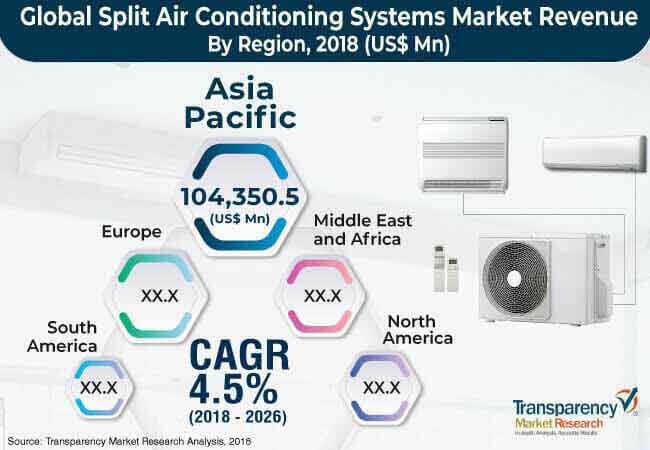 These market players have been profiled in terms of attributes such as description of the company, financials (if available), products, and key strategies to increase market share in the global split air conditioning systems market.